Last weekend was the ARRL DX Contest. As I'm not a big gun with a tower and a beam, I don't get real competitive on the DX contests. But I had some free time this weekend and operated mostly early morning (around sunrise) and late afternoon/early evening (around sunset.) While 15 meters never really opened up here, I made a lot of contacts on 20 and da good number on 40 and 80. I even managed to snag a couple of new countries, and several new ones on 80 meters. I quit when I hit 300 contacts. I had fun. That's what counts. 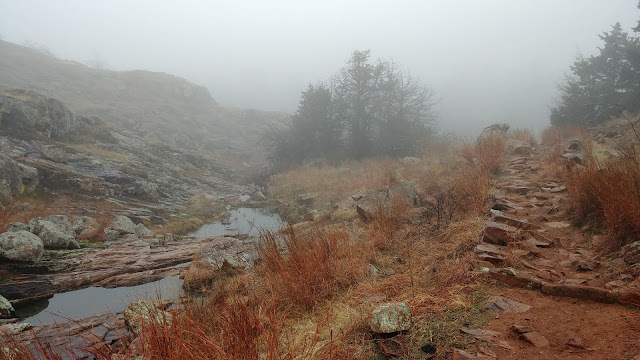 I traveled to the Wichita Mountains in southwest Oklahoma this week on a summit activation trip. As with most of my trips, my execution didn't live up to my planning. I had hoped to activate 4 summits in two days, but wound up activating two and wisely calling it quits. I have to remember my legs are 65 years old take it easy on them. As for the activations, the first on Wednesday was up Elk Mountain. It's a pretty 1.1 mile trail that's took me about an hour to climb. The only problem was the weather. I'd studied weather reports and Wednesday was supposed to be sunny and in the 50s -- perfect hiking weather. When woke in Lawton, OK Wednesday morning there was very thick fog. My plan was to do Elk Mountain in the morning and Mount Scott in the afternoon, then pick up a couple of nearby summits on Thursday and head home. In moving my blog back to Blogger I managed to lose posts from 2012 on. That's ok, I really hadn't posted much since 2014 and was ready to start fresh. So here goes. About 5 years ago we uprooted after nearly 30 years in Chicago and moved to Little Rock, Arkansas to be near my wife's family. It was a good move, and my pre-retirement move. As of July 1, 2018 I retired from full-time work, which gives me much more time to indulge in my hobbies -- ham radio, hiking and Mini Coopers. I hope to explore all three in upcoming blog posts. Here is view of shack in Little Rock. It's a modest setup, but gets done what I need. More details to come. Primary radio is an Elecraft K3 I've been operating for 10 years now. I've added the P3 Panadapter adn KPA-500 amplifier, so I have the full "K-line" so to speak. This photo is a little dated, as I've replaced the FT-101 with an Icom 765. Welcome to K9OZ log blog. I'm going to create a running account of my amateur radio activities, and hopefully shed some light onto why this is such an enjoyable hobby. 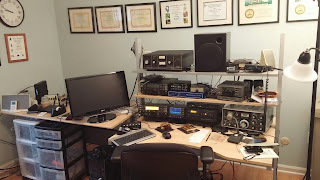 If you want to learn more about amateur radio in general, visit eham.net or the web site of the ARRL at www.arrl.org My wife, Mary, is also a ham -- K9GAL.